We're a data company at our core, so this obviously impacts ProfitWell and our users (even the free ones), including those who are based in the United States who have EU customers/users themselves. What follows is a commentary/FAQon what we've done to be GDPR compliant, as well as information on where you can get more information. If you're fully initiated and just looking for a DPA (Data Protection Addendum), you can sign our comprehensive one here or email GDPR@profitwell.com. For the rest of you, let's jump in. While regulation always costs money and time, especially when the regulation is a bit ambiguous (as some articles of GDPR are), the spirit of this regulation feels proper. You should always know where your data stand with a company and have the right to have your data deleted or "forgotten". Well for one, since we're a controller and processor of identifiable information (names and email addresses), we need to make some product updates and some contractual updates. We also put together a Data Protection Addendum for our customers that operate in the EU, which offer contractual terms that meet GDPR requirements and that reflect our data privacy and security commitments to our clients. You can sign our comprehensive DPA here on your own, but if you have any questions, email GDPR@profitwell.com. Now for the fun part - product. Given what we do at ProfitWell (subscription analytics, finances, etc. ), maintaining our top product priority of 100% accuracy and complying with a "right to be forgotten" may appear to be mutually exclusive. For instance, when you're looking at your revenue for tax purposes, you can't not report your revenue, even if a user requested to be deleted. You also still need to maintain GAAP for revenue recognition. So what's an analytics product like ours to do? Well, we spoke to lawyers, privacy professional, tax lawyers, security professionals, more lawyers, accountants and, did we mention lawyers? We found that the center of GDPR centers around the identification of a user and tying that particular user to a product or app. We also found that GDPR can't usurp tax or finance laws, so the answer fortunately started to show itself as we dug in. 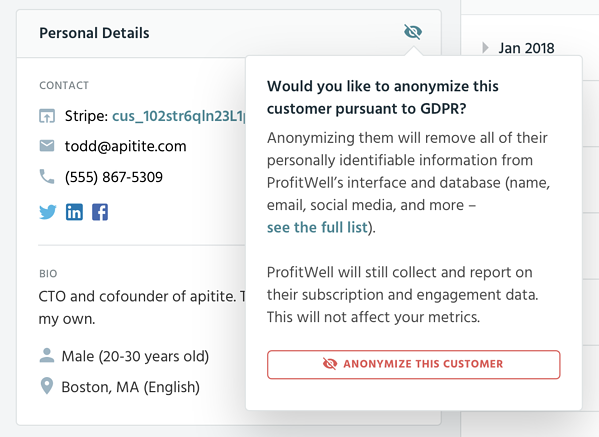 From a product perspective, we've now given the ability to anonymize a user through the Customer section, which allows you to maintain their data in your numbers for consistency and legal/regulatory purposes, but evaporates their identification from our databases. We've also added the ability to completely delete a user and their history from our databases (including all of their financial history). There's plenty of other pieces we've done on the backend for compliance, but this is the crux of what's needed to go above and beyond the GDPR call, but also make sure it's easy to not break other laws around financial and tax reporting. Talked about this above, but we put together a Data Protection Addendum for our customers that operate in the EU, which offer contractual terms that meet GDPR requirements and that reflect our data privacy and security commitments to our clients. You can sign our comprehensive DPA here on your own, but if you have any questions, email GDPR@profitwell.com. That being said, we're more than happy to oblige storing your data in the EU if you have higher bar data requirements. We've been operating in the EU helping companies and government entities for quite some time now, so we're flexible. What if I have a Data Subject Right (DSR) request to delete or update data? If it's for one of your customers/users within ProfitWell, then you can update their information right in the Customer tab (as discussed above). Any other requests to correct, access, or delete information, will be handled by emailing gdpr@profitwell.com. We'll respond to this requests within 14 days (likely much sooner as our average time to respond is 15 minutes), which is well within the 30 days required by GDPR. Who do I contact with questions, comments, concerns, or suggestions? If you need anything, email GDPR@profitwell.com, which goes to our security, privacy, and EU team.